You’re sneezing, coughing, and all stuffed up. It sounds and feels like a cold, alright. But as time goes on, you start to wonder. Is it turning into a sinus infection? Sinusitis is an inflammation of the membranes lining the paranasal sinuses — small air-filled spaces located within the skull or bones of the head surrounding the nose. 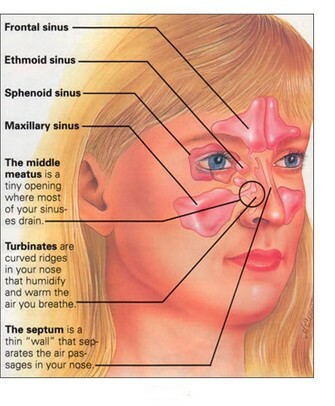 Sinusitis can be caused by an infection or other health problem, and symptoms include facial pain and nasal discharge. Nearly 30 million adults in the United States are diagnosed with sinusitis each year, according to the Centers for Disease Control and Prevention. Most people with sinusitis don’t need to see their GP. The condition is normally caused by a viral infection that clears up on its own. Your symptoms will usually pass within two or three weeks (acute sinusitis) and you can look after yourself at home. If the condition is severe, gets worse, or doesn’t improve (chronic sinusitis), you may need additional treatment from your GP or a hospital specialist. This can be difficult to treat and it may be several months before you’re feeling better. Of course, this alone won’t fix the problem permanently. Kicking up the spicy food in your life and drinking lots of pure water will help relieve sinus congestion as well. 1. Push your tongue against the roof of your mouth. Apply pressure but don’t go overboard. 2. Place your thumb between your eyebrows. 3. Press down with your thumb for about 30 seconds, applying a decent amount of pressure. Don’t push too hard though. Your sinuses will begin to drain almost immediately. This works because the vomer bone in your nasal passages rocks back and forth with the pressure, which loosens up the phlegm in your sinuses, allowing it to drain.